The parliament of Somalia’s separatist region of Somaliland overwhelmingly voted in favor to attend the upcoming international Conference on Somalia. The Conference will be hosted by the UK Government in London, on 23 February 2012. As previously noted, UK officials expect the attendance of world leaders and diplomats from over 40 countries. The vote marks a major policy shift for the separatist region, a former British protectorate, which has deliberately stayed away from several peace conferences concerning the situation in Somalia. 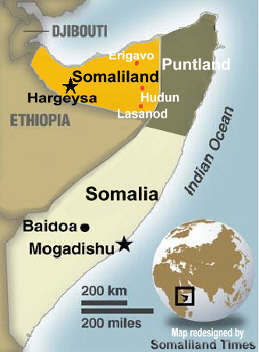 Somaliland is located in northwestern Somalia, bordering Ethiopia in the south and west, Djibouti in the northwest and the autonomous Puntland region of Somalia to the east. Somaliland unilaterally declared independence from the rest of the country in 1991 but has not been recognized internationally.